Amritsar MP Navjot Singh Sidhu's wife, Dr Navjot Sidhu, will be the BJP candidate for the Amritsar East seat. A doctor with more than 20 years of experience, she was convinced by the BJP top brass to enter the poll arena. Dr Navjot was reportedly unwilling to quit her government job. Former DGP Paramdeep Singh Gill, SAD candidate from Moga, has stated that he has no knowledge about the red beacon atop his car being used by him for campaigning and neither does he have any clue as to who had put up posters outside his election offices. The Shiromani Akali Dal promise was simple. It would make power availability in the state surplus to the requirement. The SAD-BJP government is now close to the end of its tenure, and the promise is nowhere near being delivered. One among three, the plant coming up at Talwandi Sabo is expected to have the first unit by 2012-end. Post restructuring of the PSEB, the government put PSPCL in the charge of the senior-most power engineer in the state, K.D. Chaudhari, who had a track record of bringing in efficiency in the system. Upon taking over the reins of the state, the SAD-BJP government conceived establishing six new thermal plants in the state to generate 10,640 MW of power. Three plants at Rajpura, Goindwal Sahib and Talwandi Sabo are well on the way now after delays due to recession, and rebidding in the case of the Rajpura plant. The three other plants, however, have still to take off. 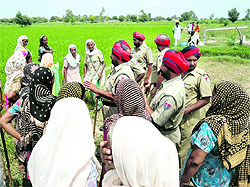 Farmer clashes over land acquisition for the plant in Mansa have held up the project. While the People’s Party of Punjab (PPP) has released the Punjabi version of the lovelorn song “Kolaveri Di” to influence young voters, the Shiromani Akali Dal (SAD) is banking on “dhadis” (ballad singers) to boost its election campaign in the countryside. This constituency, that falls in the Bathinda parliamentary seat represented by Harsimrat Badal, daughter-in-law of the CM, is being run on loan with prime property in the city mortgaged with various agencies. Incumbent Congress MLA Harminder Singh Jassi is a relative of Dera Sacha Sauda head Gurmit Ram Rahim Singh. The Dakha assembly constituency with over 1.5 lakh voters is an Akali stronghold, with the party winning eight times since 1967. Post-delimitation, this assembly segment has been placed under the general category. With the Shiromani Akali Dal (SAD) facing a strong revolt in all the three assembly constituencies in Fatehgarh Sahib district, the prospects of the party's official nominees are likely to suffer in the polls, scheduled for January 30. The strictness of the Election Commission (EC) in implementing the expenditure guidelines has started yielding results. District Election Officer Yashveer Mahajan has forwarded a report of the District Media Monitoring Committee to the Expenditure Observer to add Rs 54,904 in the election expenditure account of the People's Party of Punjab (PPP), as the party had got paid news printed as advertisements in vernacular dailies regarding the party's rally held at Sirhind yesterday in which Didar Singh Bhatti had joined the PPP. Difference of opinion between the Chief Justice (CJ) and a judge of the Punjab and Haryana High Court has surfaced, yet again. This time it is on the issue of the Chief Justice going public on the transfer of a high court judge; and another judge reacting to the assertions made by the CJ. The District Transport Officer (DTO) has suspended issuing of the registration certificates and driving licences with slogan of the SAD "Raj Nahi Sewa" printed on the back of the documents. The orders have been issued on the directives of the District Election Officer. The assembly elections in Punjab may take away the sheen from the annual Parvasi Punjabi Divas to be held here tomorrow where major issues for deliberations would be skills development, education and employment. Russian photojournalist Olga Timoshik's arrest by the Punjab Police has snowballed into a diplomatic row. Moscow has for the third time lodged a protest over her arrest "without any evidence." Central Bureau of Investigation (CBI) sleuths today arrested Dinesh Kumar, senior assistant with the Punjab Vigilance Bureau, for posing as a CBI officer and allegedly demanding money from a Ropar resident. The BJP announced the candidature of Som Prakash from Phagwara, dropping former minister Swarna Ram. Som Prakash, a retired IAS officer, had contested the last parliamentary poll from Hoshiarpur and lost. The name of Tarun Chugh has been cleared for Amritsar Central. With this, the BJP has cleared names for all the 23 seats that it is contesting.The BJP has made several changes. While two former ministers, Master Mohan Lal and Swarna Ram, have been denied the ticket, former minister Laxmi Kanta Chawla opted out of the elections. The other MLAs to be dropped are Bishambhar Dass, Sita Ram Kashyap and Harish Bedi. Chief Parliamentary Secretary Jagdish Sahni could not be accomodated with his Batala seat allotted to the SAD this time. Dr Sidhu told the Tribune: "A month ago, I had not dreamt that I would be contesting. This candidature is the outcome of the faith that the people of Amritsar have in me ". After schooling at Sacred Heart Convent School, Ludhiana, 48-year-old Navjot did her MBBS from Patiala and joined the Punjab Civil Medical Services in 1988. She has been working in the Amritsar parliamentary constituency for the past two years along with her husband. Dr Navjot, when posted as District Family Welfare Officer, Patiala, was part of a committee against female foeticide. The team exposed the 2006 Patran case. Chandigarh: The BJP will be the first party to launch its election campaign having finalised all its nominations.The BJP national general secretary and Punjab elections incharge JP Nadda has summoned a meeting of the party candidates at Jalandhar tomorrow. Denying former Transport Minister Master Mohan Lal the party ticket ticket may not go well with the BJP cadres. Master Mohan Lal, who has a clean image, was dropped from the Cabinet following CBI raids and the subsequent arrest of BJP Parliamentary Secretary Raj Khurana in a land scandal. It is learnt that both Navjot Sidhu and Capt Abhimanyu co-incharge, Punjab BJP, strongly suggested that Master Mohan Lal be accommodated elsewhere, even if Sharma was to be allotted the Pathankot seat. The party has also sidelined veteran Dalit leader and former minister Swarna Ram, who has been denied the party ticket from Phagwara. This too may cause problems for the party. Though, the CBI is yet to file a charge sheet, both Khurana and Manoranjan Kalia have been retained by the party as they are considered to be well-entrenched in their respective constituencies. Amritsar: A gynaecologist with Punjab State Health System Corporation, Dr Navjot Kaur, has applied for two months’ leave. A beaming Dr Navjot said she would resign from her post after winning the elections. She is posted at Satellite Hospital, Urban Health Centre, Ranjit Avenue, here. She said she had shifted to Amritsar about two years ago to understand the reasons for the dip in her husband ‘s popularity who had won the last elections but with a reduced margin.. Amritsar East comprises Jandiala, Verka and Amritsar North segments. He has said this in his reply to Returning Officer Chander Gaind following three notices slapped on him for violation of the poll code. Not satisfied with the “vague” reply, the RO has forwarded the same to the EC. Meanwhile, apprehending the use of muscle and money power in the ensuing assembly elections, the Moga police has divided the district into 16 sectors and demanded nine companies of Central forces to ensure free and fair polls. Ferozepur range DIG Lok Nath Angra and Moga SSP Inderbir Singh said the local police was prepared for the elections. They said an IG-rank official was coming here from outside the state as police observer to look after the security arrangements. He was expected to come within a couple of days, they added. Earlier, the officers reviewed the security arrangements and chalked out plans for the smooth conduct of the elections. More than 75 per cent of the local strength of the police would be mobilised for the elections, the DIG said. Angra said more than 6,500 licenced weapons owned by the locals had been deposited with the police stations or arms dealers in the district as per the directions of the EC. He said two security guards would be provided to each candidate contesting the elections as per the norms, but it could be reviewed. To a question, the DIG said there were no specific guidelines for those politicians who were already having extra security guards, provided to them by the Centre or the state government. Asked about former DGP Paramdeep Singh Gill who had been named as a candidate of the ruling SAD party from Moga, and that there could be chances of the use of muscle power by him, he said, “We are here to ensure free and fair polls”. She said the nominations could be filed between 11 am to 3 pm everday, except Sunday, with the Returning Officer concerned. The last date for withdrawals would be January 16. As many as 1,74,33,767 voters have been registered so far, an increase of 7,21,025 since the last elections. 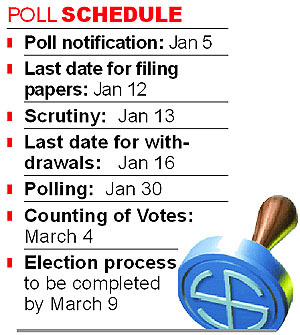 With the voter strength up, the authorities have set up 110 extra polling stations in the state. The state’s projected population is 2,79,81,217. The gender ratio in the state as per Census -2011 is 893 females per 1,000 males whereas the electoral rolls shows the ratio at 897 femasles per 1,000 males. Against the total population of 2.7 crore (as projected in the electoral rolls), 10.90 lakh youths (aged between 18-19) have registered themselves as voters till date. Covering 99 per cent of the total eligible population, Nawanshahr district has won accolades from the election department. Out of 1,74,33,767 voters, 1,73,75,216 have photo I-cards. The state will have a total of 19,724 polling stations at 12,960 locations. Meanwhile, the Election Commission of India has approved the name of Babu Lal Meena for the post of SSP, Fathehgarh Sahib. The Election Commission has banned the release of 2,500 tubewell connections by Punjab State Power Corporation Limited (PSPCL). The state government had announced 75,000 tubewell connections this fiscal year amid concerns about the depleting underground water in the state. KD Chaudhary, PSPCL Chairman , said he was yet to receive a copy of the orders. Usha Sharma, Special CEO, said the EC had decided that no new connections would be released even if an announcement in this regard was made before the poll code. The government had announced 45,000 tubewell connections under the Accelerated Release of Tubewell Connections scheme under which 30,000 connections were to be released under the general and other categories and 2500 under the PSPCL Chairman’s quota. But there is a positive too. The government may have failed to keep the 2007 manifesto promise, but it has made vigorous efforts in the backdrop of a recession period to start work on three coal-based thermal plants with a combined generation capacity of 3,920 mega watt (MW) in the private sector. With the launch of these plants at Rajpura (1,400 MW), Talwandi Sabo (1,980 MW) and Goindwal (540 MW), the government hopes the power position would ease sometime in 2013-14, except for “peaking” shortages during paddy season. 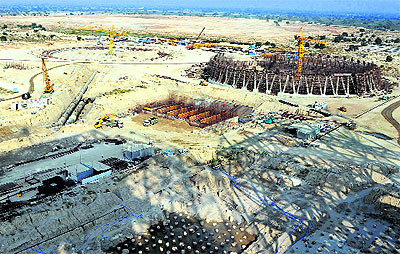 The first unit (660 MW) at Talwandi Sabo is expected to be commissioned in December 2012, and its remaining two in another six to eight months. At Rajpura, the first unit of 700 MW is slated to come up in January 2014, and at Goindwal Sahib the first 270 MW unit is expected by January 2013. Another important initiative the government undertook was the restructuring of the erstwhile Punjab State Electricity Board (PSEB) into two separate generation (Punjab State Power Corporation Limited, or PSPCL) and distribution companies (Punjab State Transmission Corporation Limited, PSTCL), even if the action was not accompanied by the desperately needed financial restructuring. Deputy Chief Minister Sukhbir Singh Badal showed the political will required to split the PSEB in the face of major employee and Leftist farmer resistance. Post restructuring, the transmission and distribution system was strengthened, improving efficiency in operations. The power supply position also improved, even though the government could not fulfil its manifesto commitment to ensure 24-hour uninterrupted supply to industry in the state. Despite taking the plunge to restructure the PSEB, the government did not follow through with the creation of autonomous companies so they may be run on corporate lines, as per the intention of the Electricity Act, 2003, which forced the government to unbundle the board in the first place. PSPCL and PSTCL have been made government departments, and have even lost the limited autonomy enjoyed by the PSEB as a board constituted under a Central act. While the functioning of the corporations has suffered after restructuring, all populist schemes like release of tube-wells to favourites have continued. The companies were also neither given a clean balance sheet nor was fresh equity infused into them. All past losses were taken over by PSPCL, affecting its borrowing limits in the open market. The company, which has accrued commercial losses of Rs 11,000 crore at present, is on the verge of financial collapse. There was no attempt at reformation. Despite a mammoth internal struggle and prodding by its alliance partner the BJP, the SAD refused to dilute the free power facility given to the 11.5 lakh agricultural tube-well connection holders in the state. The government is straddled with the responsibility of paying a subsidy of Rs 4,188 crore per annum to PSPCL, which it has paid erratically. It has also made paper adjustment — cancelling subsidy payment against loans extended to the corporation — of Rs 4,000 crore in the past five years. Freebies continue and are, in fact, being increased. With an eye on the polls, the government has widened the power subsidy for domestic consumers of certain categories, also taking in economically weaker sections and landless labourers. This has brought around 35 per cent of the state's population under this subsidy, taking the number of beneficiaries from the earlier 9 lakh (SC and economically weaker sections) to 14 lakh (5 lakh landless labourers added). While SC and the economically weak get 200 units per month (400 in a bimonthly billing cycle), landless labourers get 100 units of free power per month. This has added to the subsidy burden Rs 500 crore per annum. Surplus, but at what cost? 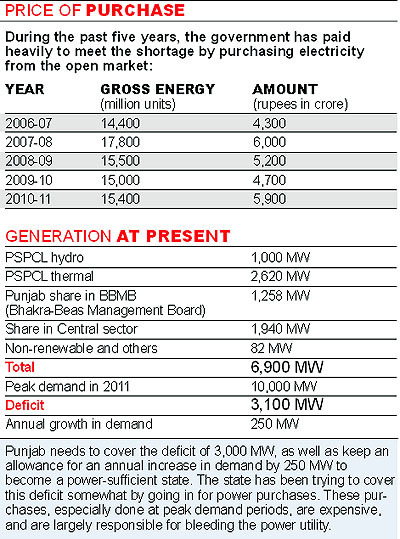 The government projects the state would be power surplus by 2013-14. But the cost of generating that power and power tariffs would be major issues. This is because the government has chosen to follow the MOU route with the three companies, rather than go for competitive bidding, as recommended by the Central Electricity Regulatory Commission (CERC). PSPCL may end up paying more for power, as the power purchase agreements with the three private players make it clear the state would have to purchase the entire power produced by them. This means, in case of fall in demand, PSPCL would have to pay the private companies fixed charges without buying any power. There are issues about all new projects coming up in the private sector too. PSEB Engineers Association president H.S. Bedi claims the government has ignored the state sector. He claims this will have an adverse impact on the power sector in the long run, adding that the state sector is needed to give competition to private players. Bedi said the government had given in-principle approval to the establishment of a 1,320 MW thermal plant in the state sector in October this year, and that this needed to be expedited. There are three state-run thermal plants at Ropar (1,260 MW), Lehra Mohabbat (920 MW) and Bathinda (440 MW), generating 2,620 MW. Even as he was not given a free hand, Chaudhari has shown results. Talking to The Tribune, he said during the past year and a half, efficiency had been brought into the system by replacing 5,000 km of transmission lines. Similarly, 30,000-overloaded distribution transformers had been "deloaded", reducing transmission losses from 20 to 18 per cent, and 10 lakh power meters had been shifted outside the premises of consumers to check power theft. Chaudhari said PSPCL had also achieved the distinction of purchasing more power in 2011 at a lesser cost by planning ahead and doubling its power banking arrangements with other states. He claimed there were no scheduled power cuts since April 2011, and that the disruptions had occurred due to storms or breakdowns. For the first time in the state, both urban and rural consumers were now getting the same supply, and IT services had been introduced for public convenience. A 1,320 MW thermal plant proposed in Mansa by India Bulls has run into problems, with farmers starting an agitation to prevent acquisition of land at Gobindpura village. The government is also yet to start acquisition of land for the 1,320 MW plant planned at Kot Shamir in Bathinda district. The 2,640 MW Gidderbaha plant is also facing land acquisition problems. Huge amounts of land are required — the Gidderbaha plant needs 2,000 acres — and land is at a premium in Punjab. Another challenge for plants fired by coal in Punjab is that the coal supply chain is very long, and thus expensive. Experts say at least 50 train loads of coal per day would be required to feed the six new thermal plants when they run to full capacity. At present, a dozen rakes feed the three state-run plants that have a total capacity of 2,620 MW. Sources say Coal India has committed only 50 per cent of the requirement for the new plants, and that these plants would have to depend on imported coal, which would increase the cost of power. Any break in this supply line could prove to be very expensive for the plant managements. Experts had recommended establishment of thermal plants near the coal pitheads in Bihar and Jharkhand. But the government did not pay heed to this advice. It has also brushed aside concerns of environmentalists, who advised against concentrating a number of thermal plants in Bathinda and Mansa districts, as pollution could become a major issue in the area once the plants started running. “For us, the next four weeks are going to be very busy as we will be performing at the election rallies of various SAD candidates during this period,” said a member of “dhadi” jatha, led by Jaspal Singh Tan. His jatha, which performs at almost all major religious congregations, is popular in most parts of the state. Before the beginning of a rally here today, Tan’s jatha of “dhadis” charged the crowd with ballads based on the Sikh history, especially those related to the period of Guru Gobind Singh. The election meeting was arranged by Justice Nirmal Singh. “Dhadis have a good understanding of the Sikh psyche and they know how to relate the Sikh history to the winning of the battles, be it poll battle or some campaign started by Akalis for their demands,” Gurdev Singh, a senior Akali leader, said, adding that he was not aware about the song “Kolaveri Di”. He said “dhadis” had a tremendous appeal in the rural areas and they fit well in the cultural ethos of the rural life. Moreover, the SAD was supposed to maintain its traditional identity having roots in religion dominated politics, although the party was now dominated by young leaders such as Sukhbir Singh Badal and Bikram Singh Majithia, he added. Meanwhile, Bhagwant Mann has not only improvised “Kolaveri Di” song to make it a PPP’s poll song but has also released an album of songs which includes a song based on popular Punjabi number “Yar Anmule” to spread the message of his party among the masses. He said music these days had a major impact on the public, mainly the youngsters. “Slogans and songs have always remained an integral part of the elections. There is a custom of making theme songs, especially in countries like the US. These songs prove an effective way to register party’s message among the voters,” said an election watcher. The Congress leadership, which has so far remained busy in selecting candidates for the assembly elections, is also likely to come out with its own version of “Kolveri Di”. 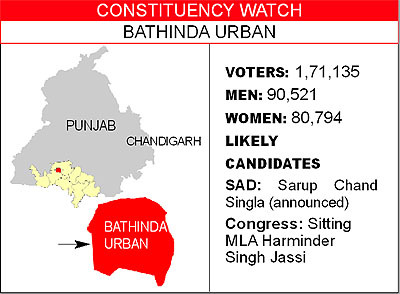 PROJECTS: The constituency comprises all the 50 wards under the Bathinda Municipal Corporation. Over the past five years, the city has undergone a sea change with the construction of railway over-bridges across the Bathinda-Dabwali road, new roads and a solid waste treatment plant on the way. The constituency has become an educational hub with the setting up of Central University of Punjab and several private educational institutes. The abysmally high incidence of cancer in this belt has prompted the government to introduce the water RO system in all the wards of the Municipal Corporation and nearby villages. While the government undertook the gigantic work of installing these ROs, it cared little to improve the quality of underground water. Also, there were charges of favouritism in allocation of ROs for different pockets. In the past five years, Bathinda has hosted two World Kabaddi Cup editions. Though the sport got an impetus with the construction of a multi-purpose stadium, other sports suffered a setback. A new stadium is under construction at Government Rajindra College. Despite tall claims, the government could not solve the problem of fly ash and it was only after the Punjab and Haryana High Court intervened that Unit IV of the first thermal plant in the state was shut down for polluting environment. The constituency is unlikely to be a cakewalk for either the SAD or the Congress. Sitting MLA Darshan Singh Shivalik had won the 2007 elections against Congress’ Malkit Singh Dakha, a former minister, securing 94,807 votes. But post-delimitation, Shivalik began focussing on the newly carved out Gill constituency, which is a reserve constituency. In his absence, Manpreet Singh Ayali, chairman, Zila Parishad, Ludhiana, started nurturing this constituency. The party has allotted him the ticket from this constituency. Qila Raipur MLA Jasbir Singh Jassi Khangura and Jagraon MLA Gurdeep Singh Bhaini are vying for the Congress ticket from this seat. The constituency consists of 108 villages besides Mullanpur and Dakha towns. PROJECTS: A number of development works are underway such as construction of link roads and laying of sewerage in different parts of the constituency. The major project in this constituency -renovation of village ponds- was the brainchild of Ayali. It was adopted by the Union Ministry of Water Supply and Sanitation and replicated in various parts of the country. Teams from different states as well as the Centre visited the constituency to study this project. To please the Dalit vote bank, the government began construction on Ambedkar Bhawan and sanctioned Rs 60 lakh for the same. The sitting MLA claims to have got Rs 24 crore from the government for constructing a grain market in Mullanpur-Dakha. He claims that Rs 12 crore were spent on sewerage and water supply projects in Mullanpur town, Rs 18 crore on a rail over-bridge across the Raikot road, Rs 17 crore for the construction of Nirmaljit Singh Sekhon Marg along the Sidhwan Canal and Rs 50 lakh each on the tehsil complexes at Sidhwan Bet and Mullanpur. Vox Populi: Shivalik’s opponents accuse him of not doing anything concrete for the constituency and concentrating more on the Gill constituency, from where he is seeking the party ticket. A section of residents say that work on re-carpeting link roads had started very late. LOOKING BACK: Since 1967, the Congress has won this constituency only twice, both 1992 and 2002. Both the times Malkit Singh Dakha was the winner. Veteran Akali leader Basant Singh Khalsa represented this constituency in 1967, 1969, 1972, 1980 and 1985 and his son Bikramjit Singh in 1997. Former Lok Sabha Deputy Speaker Charanjit Singh Atwal represented the constituency in 1977. 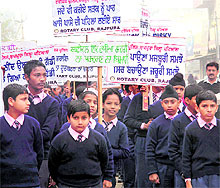 While the SAD has fielded Prem Singh Chandumajra, party's general secretary from the Fatehgarh Sahib assembly segment, Justice Nirmal Singh (retd) from Bassi Pathana and Jagdeep Singh Cheema from Amloh, many senior party leaders have revolted against the Akali candidates and are openly campaigning against them. Sitting MLA of Fatehgarh Sahib (earlier Sirhind) Didar Singh Bhatti has not only resigned from the party, but also joined Manpreet Badal's People's Party of Punjab (PPP) and has thrown his hat into the election rink against Chandumajra. If the huge gathering and the response of the people at election rallies being organised by Bhatti is any indication, then he may upset the poll equations of Chandumajra, who has been tagged as "parachute candidate". 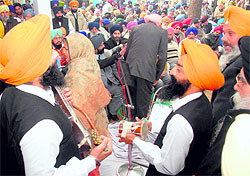 "How can the party dump Bhatti, despite the fact that he has been instrumental in all-round development in the areas falling under the jurisdiction of his constituency", was what many Akali leaders of Fatehgarh Sahib said, while adding that party's decision to field Chandumajra would prove detrimental for the SAD. In Bassi Pathana constituency, the factionalism within the Akali Dal is at its peak. Chairperson of the District Planning Committee Satwinder Kaur Dhaliwal and senior SAD leader Rajesh Pal Singh Lalli are strongly opposing the candidature of Nirmal Singh. Yesterday, when Nirmal Singh inaugurated his election office, Lalli group walked out from the function. Speaking to TNS, Dhaliwal said that she was serving and nurturing Bassi Pathana from the past five years and allotting the party ticket to Nirmal Singh was injustice with her. In Amloh, SAD candidate Jagdeep Singh Cheema, who belongs to Bassi Pathana, has been declared as an 'outsider' by a large section of Akali leaders. Leaders of the SAD and the BJP from Mandi Gobindgarh, including president of the Brahmin Sabha, Punjab, Devi Dyal Parashar, former president of the Municipal Council Sukhbinder Singh Bhambhri, president of Beopar Mandal OP Gupta and many other leaders have announced to campaign against Cheema. Similarly, he recommended to include Rs 16,100 in the election expenditure account of the SAD, as the party got published paid news worth Rs 9,600 from Fatehgarh Sahib and Rs 6,500 from Bassi Pathana regarding opening of election offices. These amounts would be entered into the shadow register and ultimately included in the poll expenditure accounts of the respective candidates. Candidates are allowed to spend only Rs 16 lakh and they have been directed to open new accounts in banks. All the expenses on rallies, banners, posters, flags and other advertisement material would be deducted from their account by the expenditure observer. BL Meena has been appointed as new Senior Superintendent of Police (SSP) of the Fatehgarh Sahib district. He replaced RS Khatra, who has been transferred by the Election Commission (EC). Khatra had written to the EC that his son Satbir Singh Khatra was interested in contesting the assembly elections from Patiala (Rural) constituency and as he was serving the adjoining Fatehgarh Sahib district as SSP, so he could be transferred to some distant area. Fulfilling his request, the EC transferred him from Fatehgarh Sahib and appointed BL Meena as the new SSP. Khatra has not been given any posting yet. Chief Justice Ranjan Gogoi is believed to have told a newspaper that an order in a Gurgaon property case was one "major reason" behind Justice Mohinder Pal's transfer. In the order, Haryana Urban Development Authority had been asked to allot 9.527 acres to Orchid Infrastructure Developers Private Limited. Justice Pal's judgment had set aside the sessions court's order that had stopped this allotment. After his transfer from the high court here, Justice Pal has been sworn in as a Judge of the Gujarat High Court. Information reveals Chief Justice Gogoi's reported comments on the issue have not gone down well with at least one of the judges. In an unprecedented move, the Judge - Justice K. Kannan - has shot off a communication to judges of the high court here, expressing his disapproval on the matter. The letter is apparently in response to the New Year's greetings. The letter, apparently critical of the comments made by the CJ before the media, is significant, as the administrative side of the judiciary functions from behind thick drapes; and whispers in the judicial corridors are seldom confirmed in public. The prevailing mood among the judges is that the judiciary's image needs to be protected by not making public the details of internal mechanism to check abrasions. This is the third time in the recent past that differences with the Chief Justice have emerged in the Punjab and Haryana High Court. In June 2008, the judges were divided over holding of the interviews for Additional District and Sessions Judges in Punjab. Prior to this, on April 19, 2004, as many as 25 judges had proceeded on mass leave in protest against the functioning of the then Chief Justice, BK Roy. Only one judge had attended the court with him. The relations between Chief Justice Roy and the judges caused considerable worry to the Supreme Court and that led to Roy’s transfer to the Gauhati High Court at Guwahati. The directives were issued after the Election Cell, while taking cognizance of the news item published on the issue in these columns, sought reply from the district transport authorities. The district transport department, in its reply to the district election officer, said the smart card registration and driving licence documents were printed at the state-level by the state transport authority. Around 3,000 such documents had been issued in the district so far, it was stated. Sources said printing of the slogan was in violation of the model code of conduct. The Election Commission has already directed all the district authorities to remove similar messages from overhead water tanks, government vehicles, government documents and public places. Interestingly, politics has been put on the hold as focus would be more on those planning to immigrate abroad for either employability, higher education or for investment in western world in general and Canada in particular. Canada, being the major partner in this event, will be represented among others by Ontario Minister for Government Services Harinder Takhar, Member of Provincial Parliament of Alberta Peter Sandhu and former MP from Ontario Gurbax Malhi. Besides these representatives of Parvasi Punjabis, Canada's Consul-General Scot Slessor will also make two presentations at the daylong conference to showcase his country's potential in education, employment and business. Though model code of conduct would debar the SAD-BJP combine from making any announcement for redressal of long-pending demands of the overseas Punjabis, Deputy CM Sukhbir Singh Badal is expected to formally inaugurate the deliberations that would be later joined by former deputy speaker of the Lok Sabha Charanjit Singh Atwal, Punjab Chief Secretary SC Aggarwal and Vice-Chancellor of Punjab Technical University, Dr Rajneesh Aora. In fact, the Embassy of Russian Federation has sent its third note of protest on her arrest to the Ministry of External Affairs. In a communication dated December 28 last, the Embassy has drawn once again the ministry's attention to the criminal case against Timoshik, a professional photographer and journalist, who helped organise numerous exhibitions on Indian culture. The letter says: "The Embassy regrets to point out that more than a year-and- half after her arrest, there still has not been even a single hearing of the merits of her case". It also says: "This inordinate delay caused constant mental stress followed by severe health deterioration of Timoshik. At present, she is completely exhausted physically and mentally suffering from constant mental anguish and deep depression and asthmatic attacks…." "The Embassy regrets to reiterate that the failure of the police to provide evidence of Timoshik's criminal activities and continuous hoaxing discrediting honour, dignity and reputation of Timoshik are detrimental to India's image as a friendly nation in the eyes of the Russian public at large". Referring to Olga's petition filed by counsel SS Behl before the Punjab and Haryana High Court, the letter says the Embassy requests the ministry to bend every effort through the concerned authorities to ensure fast response from the prosecution side by the next date of hearing. Olga was arrested by the police and allegedly subjected to third degree interrogation for 10 days during her police remand. The cops also allegedly launched a ‘character assassination campaign’ in newspapers and ‘publicised’ the ‘confidential details of her private life’. The startling claims made by the Russian were made in the petition before Justice Alok Singh for the quashing of the FIR registered under the provisions of the Foreigners Act on May 25 last year at Nangal police station in Ropar. The Punjab and Haryana High Court today directed the Punjab Secretary, Department of Information and Technology, to be present on Monday to answer the queries on procedure adopted for appointment of two State Information Commissioners — Chander Parkash and Bidhi Chand. The directions came on a PIL filed by advocate HC Arora. Dinesh Kumar initially demanded Rs 2 lakh from the complainant and later reduced the sum to Rs 50,000. The complainant was being blackmailed as there was a CBI complaint pending against him.